"We always enjoy working with the team at Radio Facilities. They provide a very high quality service both in terms of the recordings and their communication and organisation. They manage to put everyone at ease for the recordings and work quickly and efficiently throughout our sessions. We would not hesitate to recommend them. " "Friendly, professional service. We have used the studios for many years and will continue to do so." "We always use Radio Facilities for our voiceover recordings: their speed, attention to detail, technical ability, client facilities, care and attention is unparalleled. We'd never dream of going elsewhere." "Very well organised, very professional, quick and all this we done remotely. Thank you guys. For sure we will come back! " "Slick, efficient workflow and really friendly, helpful professionals who helped get exactly the recordings we were looking for. Lovely studio with all the equipment/set-up we could possibly have needed. Will certainly be using them again at the very next opportunity!" 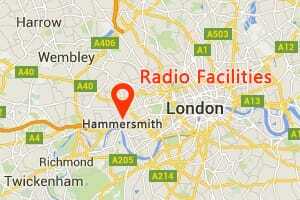 "Very happy to have recorded my first audio book La Petite Negress at radio facilities, London. Worked tirelessly with studio engineer Mark who has the patience of a Saint! I found everyone at the studio so helpful and professional. Thank you guys." "Excellent from start to finish. Quick to respond to emails, had availability, great price and excellent studio service for a complete novice recording six animations. Would highly recommend. Thank you!" "Andrew and Mark are true professionals. I would highly recommend them and their studio"
"It's rare these days for businesses (or people for that matter) ... to do 'what it says on the tin' ... Well RADIO FACILITIES in Hammersmith DOES! With Knobs on! From start to finish (and they're still on call now) courteous ... and NOTHING was too much trouble. Oh ... and they're absolutely top notch at their own personal jobs! CRACKING!" "Always great to work with you guys. A safe pair of hands." "Radio Facilities are always our first choice, and have been for years, when it comes to hiring studios for our radio days. Excellent, friendly and helpful staff, with top class facilities. I highly recommend them (and they do a mean coffee!)." "Friendly, professional and efficient service. Andrew was unfazed by the prospect of dealing with a complete novice and helped me achieve a recording that I'm sure our client will really like. Many thanks. "